For details of current courses on offer with dates and prices, please visit the Course Timetable page. To sign up, please fill in the registration form (below). This course aims to provide all-round improvement for people who already have a good command of English. If your English is pretty good but you know it could be better, or you need to communicate more confidently and effectively, this course is for you. 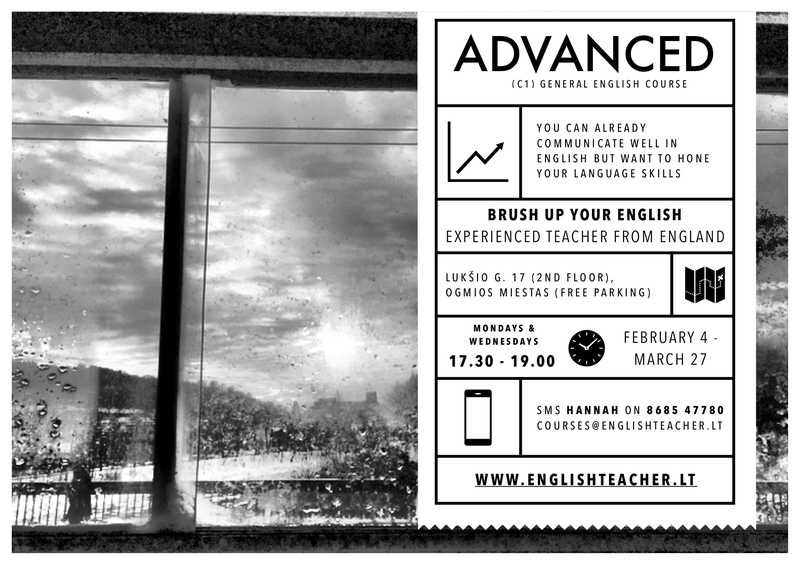 Aimed at Advanced (B2+/C1) users, you will study with a teacher from the UK in a small group. Expect to speak a lot in class and build up your vocabulary. You'll need to dedicate some time to doing things in a English outside class, too (reading, writing, preparation, watching videos, listening to podcasts, etc.). Call it homework if that helps, but I prefer to think of it as Guided Input / Home Study as it will consolidate our class activities and expose you to as much natural English as possible. Can you express yourself as fluently and accurately as you'd like? Do you catch the nuances of some fixed phrases, such as "I'd like a word with you"? What's the difference (if any) between "I've lived in Vilnius for ages" and "I've been living in Vilnius for ages"? Practise more sophisticated structures, such as conditionals and past modals, not for the sake of learning more grammar, but to help you communicate your ideas more precisely. Boost your grammar and vocabulary through lots of input from interesting reading texts about issues that matter. We'll listen to conversations you might hear in the real world beyond the classroom walls, and you'll have plenty of class time to express yourself and actually use the target language we've been studying. Our up-to-date course materials have been written by well-known writers, especially recognised for their lexical approach to teaching (which has heavily influenced my teaching ethos). I'll do my utmost to make you feel comfortable in our small and friendly group. Ready for the challenge? Please get in touch for the details of current/new groups. "My English grammar isn't bad" - Great. At higher levels, we'll focus on more complicated structures to help you convey exactly what you are thinking. You'll learn about the 'nuances' of English and the possible meanings hidden in your choice of grammar. Of course, you'll also get lots of input, feedback, and correction. "I want to improve my vocabulary" - Our materials are designed thematically, so you will boost your knowledge of general topics. You can expect to do lots of talking in class in response to me, each other, and interesting texts that we will listen to or read. "I really need to write more effectively" - This course will mostly focus on vocabulary, speaking, reading, and listening. We won't write in class. If you want to produce something at home, or have a question about something you need to write at work, I'll do my best to help, but writing is not a main aim. As it is such a personal skill, you should join a dedicated writing group or take individual lessons. "Who is going to teach me?" - Your teacher is a native speaker* who has been teaching English since 2000 in the Czech Republic, Estonia, the UK, and Lithuania. In addition to undergoing training in teaching English to adults, Hannah gained a Distinction in the 'London Chamber of Commerce and Industry Certificate in Teaching Business English' back in 2003. She has taught business people ever since (at many companies including groups and individuals at Deloitte, Rimi, Philip Morris, Teo, Coca Cola, etc.). She also works at Vilnius University, where she was voted 'Teacher of the Year 2014' at the Institute of Foreign Languages. Hannah strives to do as much Continuous Professional Development as possible by attending conferences and workshops, such as the IATEFL Conference in Brighton in April 2018. * - Does this accident of birth make me a better teacher than someone who has learned English as a second, third, or fourth language? No, of course not. Some of the best teachers I know are from Serbia, Lithuania, Estonia, and Poland. In our classroom, is there a genuine and authentic reason for communicating in English together? Yes, of course. My Lithuanian is not good enough to discuss our course topics, but more importantly, you are not paying me to improve your Lithuanian. Will we maximise our class time together by using as much English as possible? Yes. Will we sometimes compare with Lithuanian? Yes - sometimes this is quick, easy, interesting, or may help identify problems learners have. It is also about genuine communication as our 'metalanguage' will still be English. I hope I am experienced enough to gauge what methods will help you most at any point in a lesson/course. Will I pick up on cultural aspects of learning English and expose you to 'British humour'? Definitely! I have chosen to make language teaching and testing my career, so I hope you will be satisfied with your progress and our classes. I'm not the right teacher for everyone and will expect you to be dedicated to learning during the course as I know I'll work really hard to help you learn!